Adventures in sewing, fashion, fitness and photography. The Wag Doll Protocol: 2 Month Update...The Moment of Truth! How time flies when you're having fun...or working flat out! It's 2 months since I began 'The Wag Doll Protocol, Eating Clean & Looking Lean' regime, in preparation for a project I'm involved in. I described the Eating Clean side of the regime here and that's been going really well, I've stuck to the principles of my diet pretty much consistently. I did have a a major fall from grace with a girlie weekend away, but that was planned for and well worth it! There has also been much experimentation in the kitchen, some of which I've blogged about and some recipes still to write up. For the 'Looking Lean' fitness side of the equation, I've been doing a 30 minute high intensity workout 4 or 5 times a week. 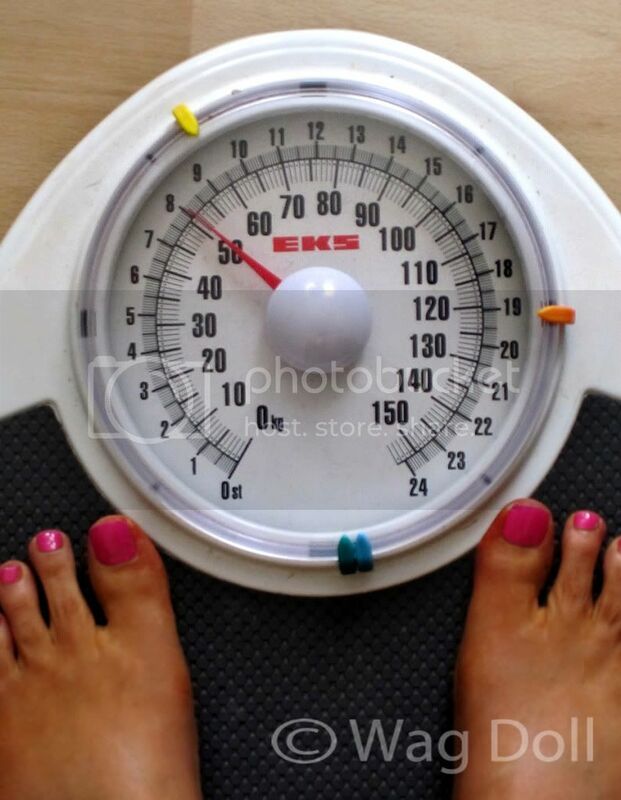 But there's only one way to see if the regime is working...cue the dreaded fit test, tape measure and scales to see what, if any, progress I've made.....eeek. Read on for the results..and gratuitous close ups of my flesh with a tape measure! OK so let's get the torture...errr...fit test out of the way. In the Show me what you're working with! post I listed the routine, and also my results. I'd become quite nervous about re-doing the fit test as I know I've worked hard, but I was worried the results would disappoint me. For a recap this is a standard fit test: 8 rounds of 50 seconds work, 10 seconds rest. Doing as many reps as possible while keeping good form. High five, break open the champagne and celebrate! There's been an improvement in all areas of my fit test, some modest, some jaw dropping! High knees, what can I say? I was can-can'ing away like the Moulin Rouge! Full push-ups, 50% improvement even though I had a pretty good score to start with. Tuck jumps, yes I might hate you with a passion but take that! I was pleased with my sit-up improvement because on the original test I was nearly crying, and cheated with feet under the sofa, this time no cheating...or crying. Again I was totally exhausted because the fit test just doesn't get any easier. But I suppose that's the beauty of it, you push yourself hard and it doesn't get easier, you just get better. I've made a note of the areas I'd like to see more improvement, cardio for one, these quick bursts of explosive energy really sap your oxygen levels. And lower body strength, the old thighs were burning. So where was this blubber shed? Let me grab the tape measure and camera and show you. Look away now if easily offended...I'm about to get the flesh out! Thighs 19.5" (was 23" in April, so 3.5 inches off each thigh....jaw dropping!) I'm shocked at this one because I knew my thighs had changed shape, less sideways saddlebag and more curving quads at the front, but I wasn't expecting such a dramatic loss of inches. Squats, I now love you! I was so happy I had some photos taken to update my Twitter and Youtube pages. So there we have it, after 2 months of regular high intensity workouts and clean eating I've seen an improvement in cardio and strength. I can see muscle definition, have abs (! ), lost over a stone and 15 inches off bust, waist, hips & thighs. I eat more than I used to, sleep better and have more energy. What's not to love? Here's to the next update because this is a journey, and I'm loving the view! Thanks for all the support, comments and help I've had from family & friends both online and real world, I really appreciate it. What's really made me happy is that so many people have contacted me to say they've made changes to their diet, or have started a fitness routine, now that really makes me smile. Cue the happy dance...high intensity of course! I am so, so impressed! What a fantastic 2 months and absolutely amazing results! I tell you, after I get this #C25K finished up, I'm moving onto a plan more like yours. I want abs too!!!! Congratulations!!! Wow! Not able to do the high intensity work out but will keep you informed with regards to the clean & healthy eating. Hope my results are as dramatic. Keep up the good work. That's a very impressive achievement. Hooking up with you guys has made me re-think some of my methods, I lost two stone in three months but three months later on, I've still got a stone left. I got my wife to take some 'before' pics late last year, I feel a blog coming on with the 'now' pics. Haven't got abs like yours Wag_Doll jealous!!! Wow.Wow.Wow. I so have to actually measure my fitness and see the improvements over time. All I know so far is that I finally manage to do 10 push ups without too much effort :| What can I say, I'm a runner, my upper body is weak. Girls Cotton Dress with Shirring & Ruffles - Easy Tutorial. Get ready for Summer! Jubilee Weekend, Shoes Fit For A Queen! (C) Wag Doll. Powered by Blogger. Blog contents © Wag Doll 2012. All rights reserved. Blogger Theme by Nymphont. Copy the code below and insert it right above the tag.